E.J. Scott is featured in the sports section of the January 12, 2013 edition of the LA Times with an article by Bill Dwyre. In the article, Dwyre talks about how EJ makes his way through life with a swagger and a white cane. He is not an athlete in the traditional sense of those whose exploits appear on these pages. But what he achieved recently is Blake Griffin-esque. He rose above the rest and completed the ultimate slam dunk. Scott has lost all but 15% of his sight to a disease called Choroideremia. His peripheral vision is all but gone. Normal sunlight is extremely painful. He was diagnosed when he was 27; he is 37 now, and his vision continues to erode. He had choices, as we all do. He chose not to take it sitting down. Scott, never much of an athlete or sports fan, got off the couch, lost 70 pounds, stopped smoking after 15 years, quit drinking beer into the wee hours of the night after stints at local improv venues and stopped having dinner at Denny’s at 3 a.m. Then he set an impossible goal. 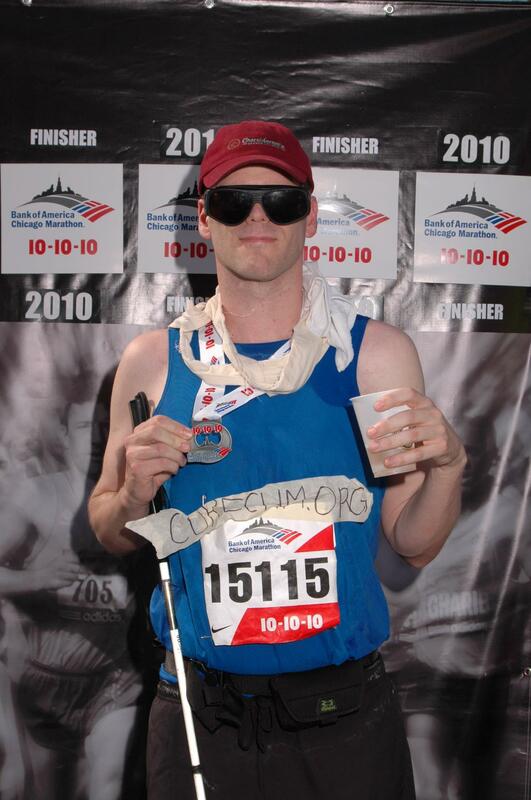 He would run 12 marathons — one a month — in 12 cities in 2012. “My 12-12-12 pledge,” he said. That, he hoped, would attract attention to him and choroideremia, and that attention would inspire donations to fund research. 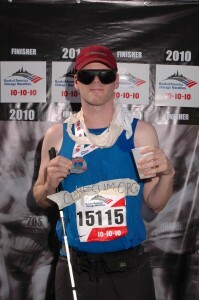 His goal was to raise $12,000 in each marathon, for a total of $144,000. He began with a marathon in Phoenix in January. From there, he ran in Austin Tex., in February; Los Angeles in March; St. Louis in April; Fargo, N.D., in May; Seattle in June; Salt Lake City in July; Mesa Falls, Idaho., in August; Dayton, Ohio, in September; Chicago in October; New York City in November and Las Vegas in December. In New York, with the race canceled because of Hurricane Sandy, he ran with thousands in impromptu four-plus circumnavigations of Central Park. In Las Vegas, a late-starting race, he was able to finish with his dark glasses off because the sun had gone down at 4:30. When he was done with 12-12-12, he had raised close to $150,000 and funds were still coming in. To call more attention to the cause, he will run again in Sunday morning’s 5k portion of the Allstate Life Insurance Los Angeles 13.1 Marathon event, which stretches across the beach cities of Venice, Playa Del Rey, Marina Del Rey and El Segundo. “I haven’t run a step since Las Vegas,” Scott said — but he adds that he has no fear of how he will do because of the inspiration he will have alongside. That is another part of this incredible story. Scott lives with his girlfriend, Deborah Ann Woll. She is a 27-year-old actress who plays Jessica Hamby on HBO’s “True Blood.” They met online after he had moved to Los Angeles from New York to try his hand at acting. It turned out they lived only a few blocks apart. Shortly after they began dating, he moved to Chicago, where there was more work in improv. But their relationship continued through the long-distance separation and prompted his return to Los Angeles. Now, after five years, they live together. She will run with him Sunday as his guide. The blindfold he will wear, fit around his head and over his sunglasses so the painful light cannot get in, was made by Woll out of curtain fabric, the kind that so effectively darkens a room. The choroideremia was passed to Scott through his mother’s genes. She does not have it, but is a carrier, as is his sister. His brother also has it. His fund-raising is more than just filling time with empty wishes. He said doctors have told him that the chances of finding a cure for choroideremia are better than other blindness-causing diseases because it is linked to a single genetic defect. Fix that and you fix choroideremia. Scott would not deny that there is more self-interest than selfless heroics involved in his marathon running and public appeals. A cure would return his vision, the ultimate dream. But other victims of this disease would happily come along for the ride, especially two boys named Aidan, 4, and Liam, 8, who live back East. Their names are tattooed on Scott’s arms, one on each. They are his sister’s sons and they too have choroideremia.